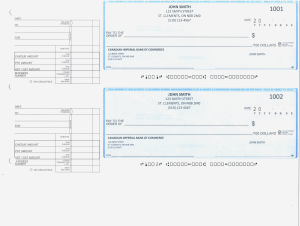 Order Cheques - GuentherTech Inc.
GuentherTech offers cheque printing services for your personal and business bank accounts, we use a premium quality cheque paper that has all the required security features to ensure account protection. Select from a variety of colours; light blue, light green and tan. Most orders are ready to ship in just one day and are guaranteed to be accepted by your bank. The signature area is printed with a different pantograph background than the cheque. The patented use of multiple pantograph designs produces voids through different density settings on the copier. 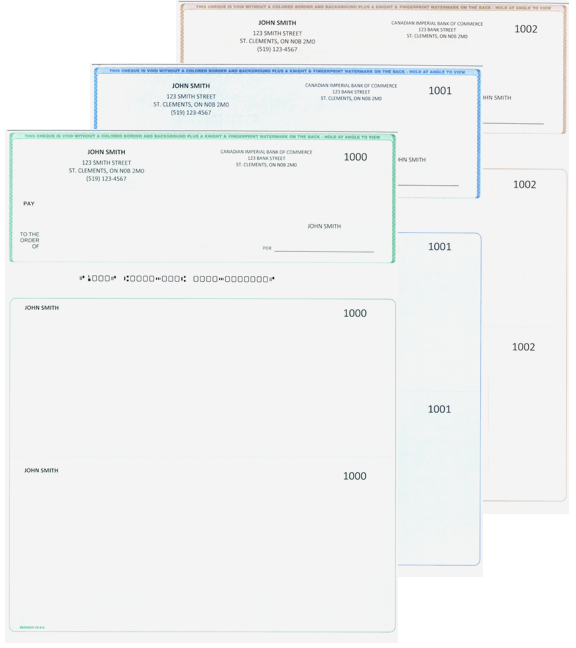 The amount line is printed with different pantograph background than the signature area and the balance of the cheque. The patented use of multiple pantograph designs produces voids through different density settings on the copier. The borders on the left & right are unique and are interwoven with hidden covert features that are very difficult to copy or scan. On our Rainbow cheques that have a multi-colour prismatic design, this border is two interwoven colours. The line borders on the cheque and the endorsement are micro printed with Fingerprint Security and can only be seen when magnified. Micro-printing cannot be photocopied or scanned. A Knight, Fingerprint Security wording and a Fingerprint are printed in the endorsement area on the back of the cheque and are facsimiles of the water marks. The endorsement is also printed with a warning clause indicating the face of the cheque contains a coloured pantograph background the same as the cheque. The artificial Knight & Fingerprint Watermarks cannot be photocopied and may be seen when holding at an angle. The watermarks will turn blue when viewed under a black light. The artificial fluorescent fibres will turn blue when viewed under a black light. January 2005, the Canadian Payments Association (CPA) introduced new specifications for cheques in order to deliver increased efficiency and speed in the Canadian clearing system. The specifications published in Standard 006 in January 2005 are designed to ensure that high-quality images can be captured from the cheques for a range of purposes, including delivery to customers and financial institutions’ internal use, as well as enabling other processing improvements not directly related to imaging.